It is pretty embarrassing to discover that not a single Western film critic is courageous enough to tell us what the latest Coen Brother’s film is all about. Those who reviewed A Serious Man inform us that this film is the Coen Brother’s most autobiographical to date, drawing on their upbringing. They assert that A Serious Man is the film many Jewish fans of the Coen brothers have always wanted them to make. One film critic also maintains that the film is deftly balancing bright comedy and bitter darkness. Some critics are genuine enough to confess that it is slightly anti Semitic but for some reason, they all fail to tell us what the film is about. What is the ideology, philosophy and symbolism behind it? They are shy of analysing the film’s metaphysics, they refrain from touching its meaning and cowardly avoid pointing to its message. A Serious Man is a cinematic allegory of Jewish cultural detachment from nature. It is a masterpiece that elaborates on the abnormalities of the Jewish tribal existence. A Serious Man does not explicitly touch upon issues related to Israel, Zionism, occupation, organ harvesting or anything distinctly identified with the Jewish state. It instead reflects on Jewish Diaspora life, Jewish segregation and the misery of operating within the kosher tribal template. It is about Jewish alienation both natural and human. Yet, A Serious Man also portrays a clear message regarding Israel and Zionism, for Israel is the Jewish state and, in spite of the Zionist promise to erect a civilised nation, Israel functions as a Jewish ghetto and is subject to all the symptoms of abnormality conveyed by the Coens. The Coen film ends with a chain of scenes initiated by a tornado alert given during a Hebrew class in a Jewish orthodox school. The young Bar Mitzvah kids are ordered to evacuate the class immediately. Next we see the storm rapidly encroaching towards the boys and girls who are now standing in the open school yard. Paralysed by awe, perplexed they gaze towards their own inevitable disaster. They stare at it, they are hopeless on the verge of impotence. Their elder teacher is right behind them, frantically struggling to find the right key for the synagogue shelter. The key to life should be in his hands, but he is obviously not going to find it. At the same cinematic time Larry Gopnik, the protagonist of the film, receives an urgent call from his doctor, his X-ray diagnosis is back. Apparently, something is horribly wrong with his body. Prior to the call, Larry was obviously totally unaware of his affliction and is thrown into a state of profound shock. Allegorically, this is the meaning of Jewish detachment and alienation according to the Coens. The People of the Book consistently fail to detect when something is going horribly wrong. They somehow fail to anticipate the storm that is coming or brace themselves for its devastating impact. They fail to interpret some minor signs of resentment before it turns into a tide of hatred. And even when they do manage to notice a rise in antagonism, they somehow employ the wrong strategy to placate it. As we often read, Jewish ethnic campaigners and institutions (ADL, AJC, BOD etc’) are always flagging up statistics, they prefer to present numbers of ‘anti Semitic’ incidents instead of wondering why these incidents occur in the first place. 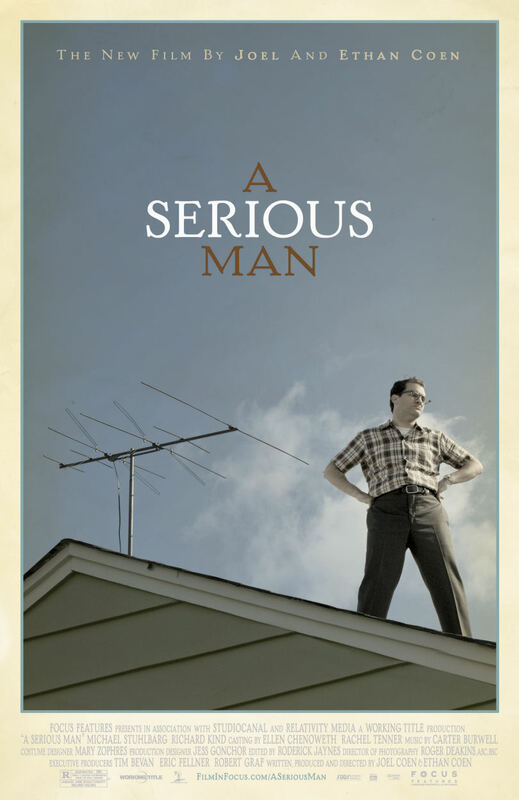 Set in 1967 Minneapolis, no doubt a very significant year in Jewish history, A Serious Man is a story about one Larry Gopnik, a Jewish professor of physics and a family man. In a matter of two cinematic hours we watch Larry’s life collapse. His son Danny, a Bar Mitzvah boy, habitually smokes marijuana. His wife Judith is dating another man who is physically no less than repugnant. She wants a divorce, she orders him to move out of the house. His daughter Sarah appears to be stealing money from his wallet so she can have a nose job. His brother Arthur has been crashing on his couch for several months, when he is not imposing himself he either drains his spinal cyst or lands himself into trouble with the law. Larry is in a total mess, he faces financial ruin, yet his disastrous life is just a cinematic glimpse into a morbid tribal society he is inherently associated with. The meaning of the above is pretty obvious. Once captured by Coen’s cinematic realm, we bare witness to an outstanding form of alienation. Larry is totally detached from his surrounding environment. He fails to notice that his wife is cheating on him. His wife seems to be libidinally overwhelmed by Sy Ableman, a greasy fat, patronizing stuffed-shirt widower who hugs those he screws over. Larry’s daughter is horrified by the nose given by her creator and wants a manmade one. Larry’s son cannot cope at all. He spends the best part of his time smoking his brains out while trying to consume American culture via an incurably fuzzy TV. In Coen’s world, even the television aerial is incapable of picking up on the surrounding signals. But it isn’t just nature Larry fails to cope with. Along the film, we follow an evolving ethical saga. Larry is put under some severe pressure by one of his South Korean students, who deposits an envelope loaded with cash on his desk to prompt Larry into granting him a pass mark. Larry is fully aware of the moral complexity. He clearly realises that he is subject to a bribery attempt. Initially, Larry is devastated by it all, he grasps that he must report it to the academic authorities. But as the film evolves, first in a dream he has and later in reality Larry ends up pocketing the money and passing the student. The dream has a crucial role in the Coen’s allegory. In the dream Larry meets his true nature, his fears, his desires and his non-ethical self. While in life, Larry is an innocent, castrated, dysfunctional family man, in his dream he somehow overcomes it all. He makes love to his friendly, stoned Jewess neighbour. He brings his troubled brother to the river and fearlessly sends him to Canada in a canoe. In the dream Larry is ethically corrupted. He donates the bribery money to his brother so he can have a fresh start. Yet, in the same dream, both he and his brother are punished immediately. The ‘anti-Semite’ next-door neighbour hunts them both with the rifle he normally saves for animals. ‘Kill the Jew” the Goy orders his son. This is when Larry wakes up. ‘Unconsciousness is the discourse of the other’ says the French psychoanalyst Jacques Lacan. In the dream, Larry is confronted with his guilt through his Goy neighbour. As soon as Larry accomplishes his crime, the Goy sees through him and executes him. Rather than just ‘being non ethical’, it is the fear of ‘being caught out being non ethical’ that torments Larry. It is the discourse of the (next door Goy) other that introduces Larry unconsciously to the sense of guilt. A Serious Man opens with a quote taken from Rashi. “Receive with simplicity everything that happens to you”. Rashi is a Medieval French Rabbi who offers an eloquent interpretation that is rather similar to the one given by Biblical Job. The Book of Job is seen by most commentators as an attempt to reconcile evil with the existence of God. Such an attempt was very common amongst Jews after the Shoa. Jews both religious and orthodox repeatedly asked, if there is a God out there, how did God let Auschwitz happen? To a certain extent Larry is asking his local Rabbis a very similar question: ‘What is the Shem (God) trying to tell me?’ The Rabbis are left with no answer to offer. Just like Job and Rashi, they have nothing concrete to suggest other than ‘acceptance’. In Coen’s latest film the Rabbis are there to spin, to convey a pretence of ‘logos’. They are there to cover a ‘black hole’. In the Coen’s allegory the Rabbis cannot reconcile evil and God, nor can they explain Jewish suffering. In Coen’s film the Rabbis are there to evoke a false impression of wisdom. Interestingly enough, the Coens present an answer of their own to question to do with Jewish suffering. It has nothing to do with the Shem, God or Yehovah. It is actually the morbidity inherent in the Jewish tribal setting that is the root cause of Jewish suffering. While in the film, it is the Goy neighbour who initially leads Larry to face his guilt through self contempt, in reality it is the Goy spectator who is being exposed to Jewish secrecy via the Hollywood big screen. Thanks to the Coens, we are confronted with that which the Jews would prefer to disguise. To a certain extent the Coens are adopting the role of the whistleblower. They bring to light the notion of the Lacanian ‘discourse of the other’, the Coen’s Jewish tribal cinematic reality is the Jewish unconsciousness. It is that which the Jews are far from being proud of. It would be intelligible to argue that, like Al Jazeera and Press TV who transmitted the true Israeli brutality throughout Operation Cast Lead, the Coens are exposing the Jewish Ghetto malaise to an audience of millions. It is rather obvious that the Coens are not longing for their Jewish past in Minneapolis Jewish Ghetto. For a pretty good reason the film is seen by some as a crude manifestation of self-loathing. Yet, it is hardly surprising that intelligent and creative assimilated Jews indulge in self-hatred. History teaches us that the most universally inspiring Jews, I mean, those who contributed something to humanity rather than merely to their own people or even just themselves, were motivated by some form of self hate. The first names that come to mind are Christ, Spinoza and Marx. In the last two decades, due to Israeli barbarism, an influx of Jewish lobbying together with a growing opportunity for Jews to depart from their tribal setting, Jewish self loathing is becoming an intellectual tide. But it doesn’t just stop there, thanks to some great creative minds that are involved in this emerging discourse; Jewish self loathing is also a poetic universal and ethical humanist message. It is no doubt a great shame that people who are subject to the Judeo centric tribal setting fail to regard the Coen brother’s and others people’s work as an opportunity to self reflect. But in fact, this is what Coen’s film is all about.